PCS is a preschool through 8th grade elementary school committed to academic excellence and spiritual development. PCS is a Christian school that integrates the truth of God’s Word into each aspect of the school’s curriculum. PCS offers a competitive junior high athletic program. School teams include basketball, volleyball, softball, baseball, cheerleading, and track and field. PCS is a well-established school that has served the academic and spiritual needs of the community for over twenty-five years. PCS is a school whose annual achievement test results have traditionally scored above the national norm. PCS has experienced teachers who are committed to academic, spiritual, and social health of their students and who serve as the school’s “living curriculum” for Christian love and character. PCS is a school with low student-to-teacher ratios. PCS is a school that has an early education program consisting of programs for 3-year olds, 4-year olds and 5-year olds. PCS is a great educational value, with low tuition rates and high academic standards. PCS students attend a variety of churches and live in a number of local communities. PCS has a Bible-based curriculum that acknowledges the truth of God’s Holy Scriptures as the foundation of all truth. We avoid liturgical doctrines, while upholding the moral, historical and universal truths of the Bible. PCS supports the efforts of the home and the church to raise children who love God and who apply the truths of the Holy Scriptures to their personal lives. 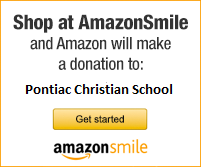 PCS has an active parent/teacher organization (PTO) that supports the school by raising funds for school needs and providing volunteer help for school programs.